Who's the biggest thing in New York right now? Is it Knicks point guard Jeremy Lin, the unlikely guy leading his team on an improbable charge to .500, collecting terrible, punning tabloid headlines along the way? Or is it Giants quarterback Eli Manning, the unlikely guy who led his team on an improbable charge to the Super Bowl, collecting terrible, punning tabloid headlines along the way? To find out, on Wednesday we called 18 of New York's most exclusive restaurants, with one of us posing as an assistant to Lin and another as a representative for Manning. For each athlete, we were looking for a table for six people at 8 p.m. today, an off-day for the Knicks—and, this being a Thursday, a very busy one for New York's finest dining establishments. Most of the restaurants listed below are famously difficult places to find a table; some are booked up well into spring. So who got seated where (and when)? Final tally: Manning had only two flat rejections, while Lin had four. Of the restaurants that offered to seat Manning at another time, only one, Per Se, bumped him from his 8 p.m. request by more than a half-hour. 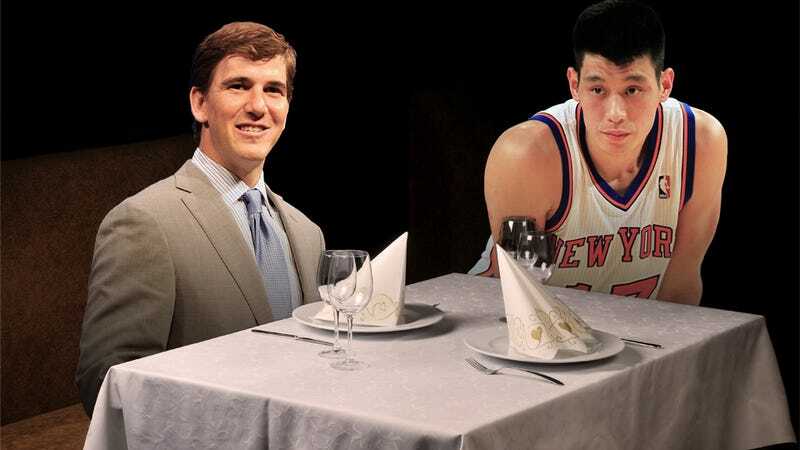 Lin got a better offer than Manning once: at L'Atelier de Joël Robuchon. Linsanité! Pat Burns and Dave Shireley contributed reporting.